Contributors Fundamental Analysis As the Brexit Deadlock Lingers, What’s Behind the Pound’s Rally? After Theresa May’s Brexit deal suffered the biggest Parliamentary defeat in history for a sitting government, few would have thought the pound’s response to the latest setback for the prime minister would have been to head higher. However, as British MPs grow increasingly determined to take control of the Brexit process, investors are becoming convinced that there is no majority will in Parliament to allow the country to leave the European Union without a deal. The pound hit a new 11-week high on Thursday, coming close to hitting the $1.31 level, as the latest developments in Westminster led traders to speculate that a no-deal scenario could soon be taken off the table. The extent of opposition to the PM’s plan, which first became evident in December and forced May to delay the vote on her deal, has resulted in various amendments being put forward by MPs to limit the government’s power in the event it fails to come up with a proposal that would win parliamentary support. The most notable amendments were to the Finance Bill, which restricts the government’s ability to respond to a no-deal Brexit with respect to spending and taxation, and the Grieve amendment that required May to present her Plan B in just three working days when her deal was rejected last week. The amendment was aimed at preventing any attempt by May to scare MPs into accepting her tweaked plan by scheduling the vote closer to the exit date of March 29. However, the most significant amendment could be the one that’s currently being mooted and one that is gaining traction among senior Labour party members. Labour MP Yvette Cooper is proposing that Parliament should be given time to debate a bill on delaying Article 50 if May’s Plan B is rejected when it’s put to a vote on January 29. The bill would first provide for the government to come up with a revised Withdrawal Agreement until February 26, which, if voted down again, would grant MPs the power to demand a nine-month extension to Article 50. If Labour decides to back the amendment, the pound could extend its recent gains as it could put lawmakers – and not the government – in the driving seat should May’s final offer get defeated. With the amendment also likely to gain the support of some ‘remainer’ Conservatives, it stands a good chance of being passed. Furthermore, as there’s still a few days of debate to go before the January 29 vote, additional amendments that would take the decision making away from the government’s hands and allow MPs to determine the next steps are possible. As a result, technical indicators for sterling have turned strongly bullish with cable crossing above its 20- and 50-day moving averages (MA) to touch its 200-day MA. A clear break above the 200-day MA, currently in the $1.3065 region, could drive the pound towards the $1.32 level, taking it above the 38.2% Fibonacci retracement of the downtrend from 1.4376 to 1.2436. However, cable could struggle to run even higher, with a move towards the $1.33 handle likely proving more challenging unless there is decisive progress on the Brexit front. While a successful attempt by lawmakers to get Article 50 extended would avert the immediate threat of a no-deal scenario, it wouldn’t resolve the Brexit dilemma and more months of uncertainty would ensue. The next step by MPs, if the exit date was delayed, could be to call for a second referendum. Such a move is favoured by investors as it would increase the odds of reversing Brexit. However, there’s unlikely to be a majority in Parliament for another referendum and a ‘softer’ Brexit such as the ‘Norway option’ are more probable outcomes if the government fails to fix the Irish backstop issue that has been plaguing May’s Withdrawal Agreement. But as traders increasingly price out the risk of a no-deal Brexit, can we really be sure that the British Parliament will be able to block a disorderly exit? Brexiteer Conservative MPs may not like May’s plan but are more likely to support it if faced with the choice of a delay or no Brexit at all. The Democratic Unionist Party, who are propping up May’s minority government, could also vote in favour of a modified deal if it meant preventing a second referendum. However, with some Remainer Conservatives still possibly voting against the government unless a drastically improved deal was on offer, the task of ever getting a majority on how to proceed with Brexit could prove impossible. If in the next few weeks Parliament remains as polarised as ever, sterling could see a sharp downward retracement as the reality of a no-deal Brexit starts to re-emerge. Cable could immediately tumble towards the recent support at $1.2825 if Cooper’s amendment doesn’t pass at next week’s vote. A steeper decline would bring the previously congested region of $1.2675 into focus. 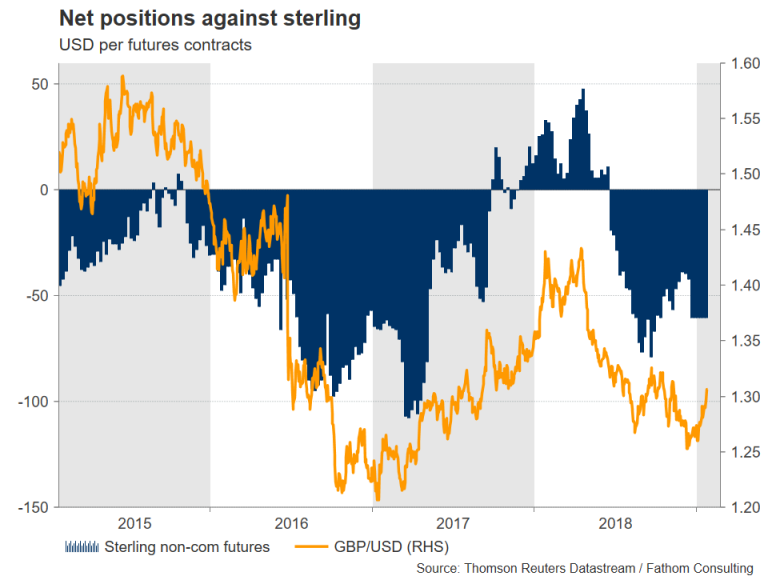 But if MPs fail to reach any consensus in the coming weeks, sterling could suffer a heavier sell-off, with a breach of the 21-month low of $1.2436 plumbed earlier in January becoming probable. A drop below that point could see cable revisit key supports from 2016 and 2017 at around $1.2350 and $1.21.